If you’re looking for powder coating services in Washington State you’ve come to the right place. We are a full service powder coating facility. We provide sandblasting, phosphate washing and powder coating under one roof. This is important because we maintain quality control throughout the process. We can handle all types of residential, commercial and industrial projects. Our work, which you can see examples of on our gallery page, has supported many markets including, car and motorcycle restoration, handrails, patio furniture, housing development signage, retail store signage, point-of-purchase displays, city signage and maintenance projects, electrical enclosures, lighting fixtures and transportation companies to mention a few, increasing the durability of an endless variety of products. Protect anything metal: Powder coating is the perfect protective solution for any metal structure or object. We can powder coat aluminum, steel, stainless steel and brass. Increase durability: 100% of a successful powder coating project begins with the preparation. Our powder coating process begins with proper cleaning. This may entail sandblasting, for sure an alkaline and phosphate cleaning, or a combination of both depending on the project. During the cure cycle the powder melts into the substrate and also cross-links onto itself creating an unbeatable fusion bond with the part that will ensure superior durability. 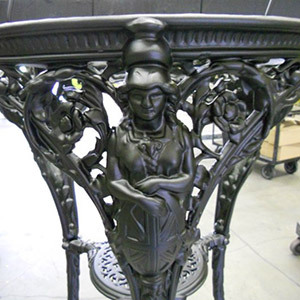 Provide decorative finish: Check out our powder coating images in Washington to see how powder coating not only extends the life of your products, but also offers an ornamental finish to increase their aesthetic appeal. Go green: Powder coating contains no carcinogens, solvents or hazardous chemicals, providing a finish that is safe for both family use and the environment. Get quality assurance: Our team has over 60 years of combined experience, bringing unparalleled skill and expertise to any project. And before we ship any parts, our quality assurance department performs a complete inspection to make sure the quality is optimal and that you receive the exact service you requested. Take a look at our powder coating blog to learn more about what powder coating can do for your products, or call 425-222-6363.